Chetham’s School of Music is grateful to have received a complete set of Sir William Walton’s scores, published by Oxford University Press, as a gift from the William Walton Trust and the Fondazione William Walton e La Mortella. The School was delighted to welcome Dr. Alessandra Vinciguerra, President of the Foundation and Director of the Gardens of La Mortella on the island of Ischia in the Gulf of Naples, which was the home of Sir William and Lady Susanna Walton for many years. She was joined by Caroline Howard, who is responsible for the summer season of youth concerts in the Gardens, in visiting the School to present the set of Walton’s music to the Music Department. 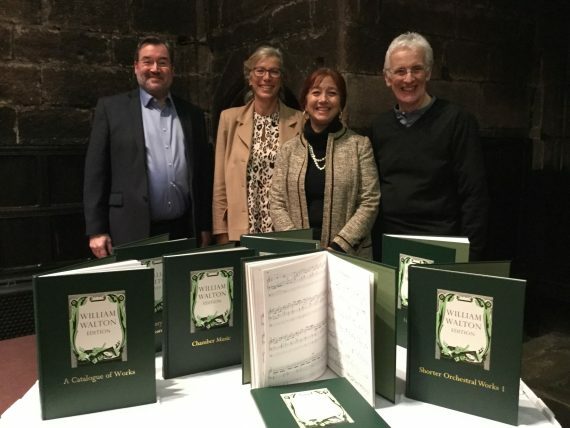 Chetham’s friendship with the William Walton Foundation, and Lady Susanna in particular, dates back to the late 1990s when the School’s students performed for the third time at the Oldham Walton Festival. Their landmark performance of Walton’s Cello Concerto with soloist Ben Birtle, and Henry V: A Shakespeare Scenario, conducted by Stephen Threlfall with his brother David Threlfall as narrator, sparked a friendship with the Trust which has continued over many years. Since then, Chetham’s students have made numerous visits to the island of Ischia to perform both solo and chamber repertoire, most recently in the summer of 2016, when the Chamber Orchestra performed Prokofiev’s Peter and the Wolf with Giovanni Visentin of Inspector Montalbano fame. During their visit to Manchester, Alessandra and Caroline heard three of the six bagatelles that Walton composed in Ischia for the guitarist, Julian Breem, performed by student Henry Rubiano Poveda, age 17. This is wonderful news. Very fitting.